Several weeks ago, it was written by a reliable source in Rome that Cardinal Ratzinger, prefect of the Congregation for the Doctrine of the Faith had written to the American bishops that if Catholic politicians who were pro-choice [favoring the killing of unborn children] did not recant their position, go to confession and ask for forgiveness they should be refused the Eucharist. Can you believe Ratzinger's new letter? Was the other letter a lie - a hoax? 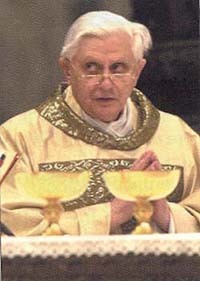 What does Ratzinger's statement mean, in harmony with the congregation? How about being in harmony with God? Does the Commandment, "Thou Shalt Not Kill," mean anything to these Bishops, or am I to understand that for these Prelates an unborn child is not the equivalent of a born child,or an adult. This presumption is the only possible way that they can say that whether or not those who favor killing unborn children be presented the Body and Blood of our Savior should be at the discretion of their local Bishop. Would they come to a similar conclusion if the Catholic politicians subscribed to a proposition that women shouldhave the right to have their born babies killed? Of course not. The only conclusion one can derive from this new Ratzinger letter and the views of all but about a handful of Bishops in the United States is that they do not consider that unborn and partially born children are worthy of protection. They do not believe that human life must be protected from the womb to the tomb. They have just admitted that all this is rhetoric, just pure garbage. They have sided with John Kerry and the rest of the pro-choice Politicians -- unborn children are fair game. A child must be completely born to be protected from a savage and gruesome death; then and only then will the bishops come to the aid of the least among us. Then and only then it will not be left up to the whim of each individual Bishop to heed God's command, "Thou Shalt Not Kill." It is obvious that most American bishops do not consider unborn children to be real people. They do not practice what they preach. Isn't that nice of Mahony. This is a Cardinal? Such is the condition of the Catholic Church. It has steadily gone down hill since Vatican II. Sin is now a sin only when you think it is a sin. As a matter of fact, John Kerry, on the Larry King show last week, referred to Vatican II to justify his pro-abortion stand -- that is, that one must seriously examine his conscious to determine if something is sinful. Since Kerry is a liberal, everything goes. There are no sins. That no absolutes exist is the general order of the day, even for Catholics. There are no more absolutes anymore. A sin is a sin only if you think it's a sin. So, if someone irritates you and you think they are an inconvenience, maybe your own husband or wife, or your next door neighbor, just shoot him/her, because in your mindit is not a sin -- it was justified. Canon 1436: Whoever denies a truth which must be believed with divine and Catholic faith, or who calls into doubt, or who totally repudiates the Christian faith, and does not retract after having been legitimately warned, is to be punished as a heretic or an apostate with a major excommunication; a cleric moreover can be punished with other penalties, not excluding deposition. If Bishops are no longer going to heed Canon Laws, then we might as well get ride of the laws. They have become a joke. Thanks to our Bishops they are not worth the paper they are written on. Because of these so-called Bbishops, Catholic women will continue to have their unborn children killed at the same rate as the general population and Catholics in general will continue to be in the lead of Protestants in voting for pro-abortion politicians. Baby killer Kerry can only win the presidency if he wins the Catholic vote. It was only by winning the Catholic vote that made it a near election for pro-abortion Al Gore in 2004. Here's the bottom line: The American bishops know they are mocking Canon Law and coddling heretics, but their politics (getting rid of Bush) is paramount. Why else would they knowingly commit a sacrilege by offering Holy Communion to people they know have mortal sins on their souls -- persons who do not believe in Catholic Doctrine and therefore are heretics. People, like Kerry, who actually said that he indeed dissents with the Catholic Church on the abortion issue?